Watch HSUS CEO Wayne Pacelle And Oprah! Hey everybody—Wayne Pacelle chats with Oprah on "Super Soul Sunday!" 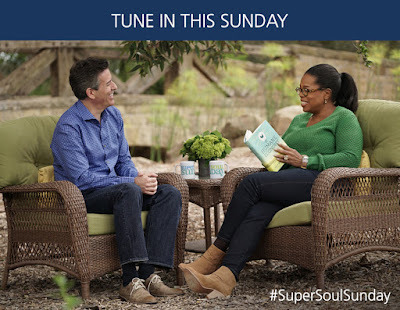 Since we're on the mailing list of the Humane Society of the United States , we received this notice the other day, letting us know that HSUS CEO, Wayne Pacelle, would be chatting with Oprah as part of today's "Super Soul Sunday". We're big fans of both the HSUS and it's CEO, Mr. Pacelle, and we're also fans of Oprah—although we've never tuned in to her television station, OWN, ...until now. We've DVR'd this program and are heartily recommending it to all of our readers. As you might remember, Parental Unit had the pleasure of talking with Mr. Pacelle during the book tour for his first best selling book, The Bond: Our Kinship With Animals, Our Call to Defend Them. Now Mr. Pacelle has written a second book, The Humane Economy: How Innovators and Enlightened Consumers Are Transforming the Lives of Animals which he discuses with Oprah during their hour-long conversation. The conversation airs today at 11:00 a.m. and 7:00 p.m., EST, and we bet it will be repeated many times, so if you don't read this in time, please keep a lookout on OWN! Let us know if you see it and what you think—we're excited to hear your opinions! Bummer that we missed it. We will definitely look for the rerun! Sorry that we posted a bit late! Parental Unit and I watched it and thought it was fantastic! Their discussion is quite helpful in describing the small things each of us can do to make our world more humane for the other living creatures we share it with. We're looking forward to reading this book!